Just say no to SOPA and PROTECT-IP (PIPA). December 30, 2011 on 5:49 am | In global news, site updates | Comments Off on Just say no to SOPA and PROTECT-IP (PIPA). 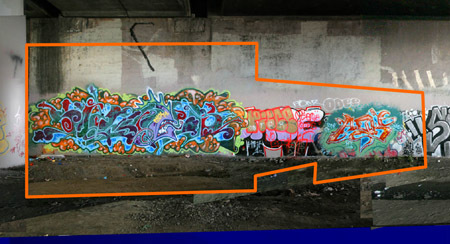 Graffiti Archaeology’s domain has been registered at the sketchy domain registrar GoDaddy.com for several years now. But then GoDaddy announced its support for SOPA, an extremely toxic bit of legislation being considered by the US Congress, which if passed, would empower a single government bureaucrat with a switch to kill any web domain of his choosing, without any public oversight, due process, or even notification to the owner of the domain being killed. SOPA (and its evil twin, PIPA) would effectively destroy the free Internet as we know it, and it would very specifically pose a threat to projects like this one. So I’m happy to announce that as of today, we’re taking our business elsewhere. Visitors might experience some downtime as we get the DNS records established with our new registrar, but hopefully it’ll all be straightened out quickly. October 22, 2011 on 7:09 am | In site updates | Comments Off on aaaaaand, we’re back! After ten years of running without a hitch, this site hit some major stumbles in the past 18 months. First the database went down, then the entire server. Fortunately now everything is up and running again, hopefully more smoothly than ever. The permissions continue to roll in for photos of London’s Undercroft. This week three more people have filled in some gaps in the timeline by contributing their photos: Dancing Fish, Patrick John Quinn, and Hatters! This brings the total depth up to 32 layers for panel2, and 25 layers for panel3, spanning a period of almost two years. Thank you all! More layers and more walls to come. Stay tuned. Shown here: undercroft/panel2 layer 27 of 28, May 3 2008. Photo by meophamman. The great jigsaw puzzle of London’s amazing Undercroft skatepark continues to occupy many of my hours these days, thanks to the incredible wealth of photos available on Flickr, and the generosity of all the photographers who have allowed us to reuse them here. This week’s offering: 28 layers on the new wall “panel2”, plus an additional four on “panel3”. (Don’t ask about the numbering scheme—it makes sense to me, but it’s completely arbitrary.) The list of contributing photographers here is almost as long as the wall itself: Pierre Andrews, bryans_d80, Paul Carstairs, Jason Delport, Matthew Gidley, Michael Godek, Samuel Judge, Amit Kanekal, Will King, Leeks, meophamman, RedLeeroy, Roberta (retrotravelbug), Romanywg, and thirtyfootscrew. And that’s just the people who responded within the first 48 hours of my request for permission! There are many others out there, and I’ll continue to post their contributions as the permissions come in. 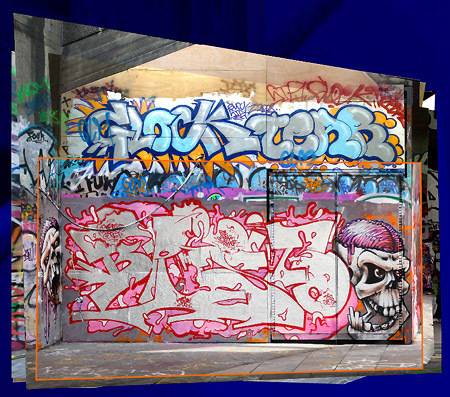 Shown here: undercroft/panel3 layer 14 of 17, featuring work by BLAM and BONZAI, January 13 2008. Photo by Leeks. 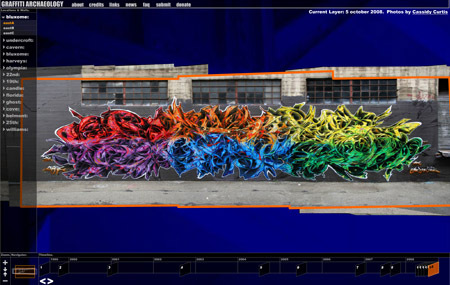 Today Graffiti Archaeology finally leaves the confines of North America with our first international location! 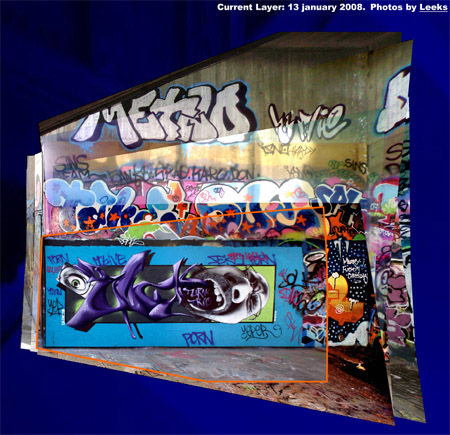 “The Undercroft” is a skate park located under the Queen Elizabeth Hall in London’s Southbank. It gets its name from the vaulted spaces under cathedrals, to which it bears a strong resemblance thanks to a series of flared columns that run through it. The spot is frequented by skateboarders, BMX bikers, the occasional unicyclist, and of course, graffiti writers. The wall shown above is just one of about a dozen panels that surround the space. I’ll be building out timelapse montages of the rest of the walls as time allows. Many thanks to Flickr users Jason Delport, Uli Rahms, CourtneyLouise, jessthecat and Leeks for their photo contributions. See our Flickr group for more photos of this amazing space. Apparently there is some danger that this cultural hotspot and meeting place may be shut down or made inaccessible to the public in the near future. If you live in the UK and are eligible to vote, there’s a petition you can sign to appeal for its preservation. 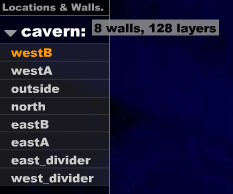 Shown here: cavern/westB layer 49 of 54. Piece at left by SILENCER. 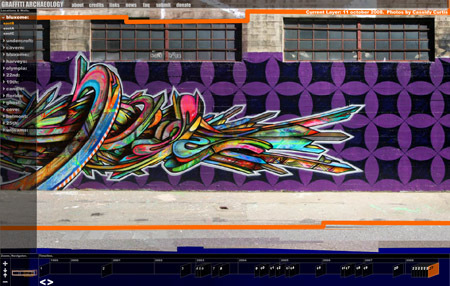 Just brought cavern/westB up to date with 15 new layers (one of them courtesy of Flickr user Luba Roniss) featuring new work by SILENCER, SAGER, RYZ, KEAP, MESR, AURA and many others. The buff patrol also made a cameo appearance (20 January 2008), but it took no time at all for the wall to bounce up to new heights, with a CMM blockbuster and some stunning new burners. Enjoy! Sorry for the change in appearance here at Graffiti Archaeology News– our old blogging software got hacked by phishers, and we had to port everything from Movable Type to WordPress, leaving some templates and stuff behind. Things may be a little squirrely around here for a little while. Stay tuned for updates.